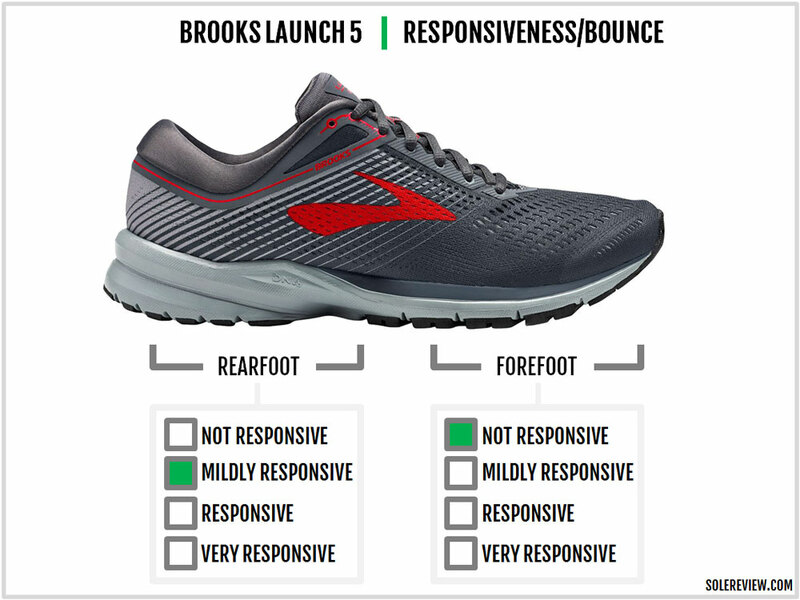 Brooks’s marketing pitch: Springy and fast with zero distractions. Upper: Engineered mesh, inner sleeve. Midsole: Single density EVA foam midsole. 10 mm heel to toe offset. Brook's lightweight daily trainer gets a brand new knit upper with an inner sleeve. The Brooks Launch’s no-nonsense, do-it-all nature is what makes it so popular. This is a shoe which is lightweight, not very expensive, and well put together without signs of compromise. Truth be told, there aren’t many of these around. Due to its firm and lightweight ride, the Launch is also a bridge between softer daily trainers (say, the Ghost) and race day shoes like the Hyperion. The Launch’s firm yet padded midsole in a 9-ounce package makes it suitable for fast training runs while forgiving enough for longer distances. The Launch 5 uses an identical midsole design as the 4 so it’s business as usual in the ride department – except for the less firm foam. The refreshed upper is where the all the (new) action is. Be it the new Levitate-like upper design or the introduction of an inner sleeve, the Launch 5’s upper looks and feels brand new. The updates affect the upper fit quality, the result of which is a more relaxed midfoot/forefoot and pointier toe-box. Considering that the Launch’s midsole is molded out of an EVA foam variant, the superfluous marketing is a bit of a stretch. The Launch is certainly no Levitate or the Boston. At best, the Launch 5’s injection-molded midsole acts as a lightweight cushioning platform suitable for fast-paced daily training. The Launch always had a firm ride so do not expect Ghost or Glycerin levels of cushioning plushness. There’s a slight bit of rebound from the under-heel cavity and the foam compression (helped by the sidewall ridges), but then that’s true for most foam-based running shoes. The forefoot has decent cushioning but of a flat kind; some softness is provided by the insole and the blown rubber outsole. You have to keep in mind that the Launch has a 10 mm heel to toe offset, so the rearfoot gets most of the cushioning stack. And unlike overly soft shoes, the variance between published and loaded (when running) heel drop isn’t wide. Despite featuring the same midsole and the outsole as the V4, the Launch 5’s midsole feels a mite softer. Since foam density is independent of the midsole design, it is perfectly feasible to make the foam softer even with an identical midsole design. The firm-ish ride quality makes the Launch the shoe it is. Transition quality benefits from the single-density design so the Launch feels efficient – an ideal trait to have when you’re going fast. The Launch is also lightweight for its class (9-ounce), so that’s another brownie point. Regardless of your footstrike type, you’ll find the forefoot grip and push-offs excellent. The blown rubber outsole has a colony of small lugs which have a superior grip quality – the kind which is conducive for fast toe-offs. Stability is decent on the Launch. It’s ‘decent’ because the Launch does not have a wide outsole footprint. It has a narrow midfoot waist and a midsole with grooved ridges on the side. 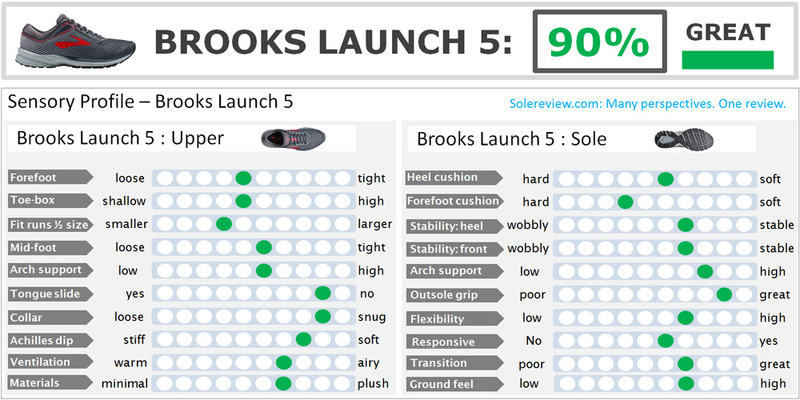 With the foam softening up a little, the Launch 5’s stability levels are good but not great. Due to the firm ride quality, the Launch 5 is good for up to a half marathon. Any longer, and you might want to consider a running shoe which won’t beat your feet down – like the Ghost or Glycerin, for example. The Launch has some top-layer cushioning provided by the foam insole. But for many, that might be insufficient comfort for 26.2 miles. 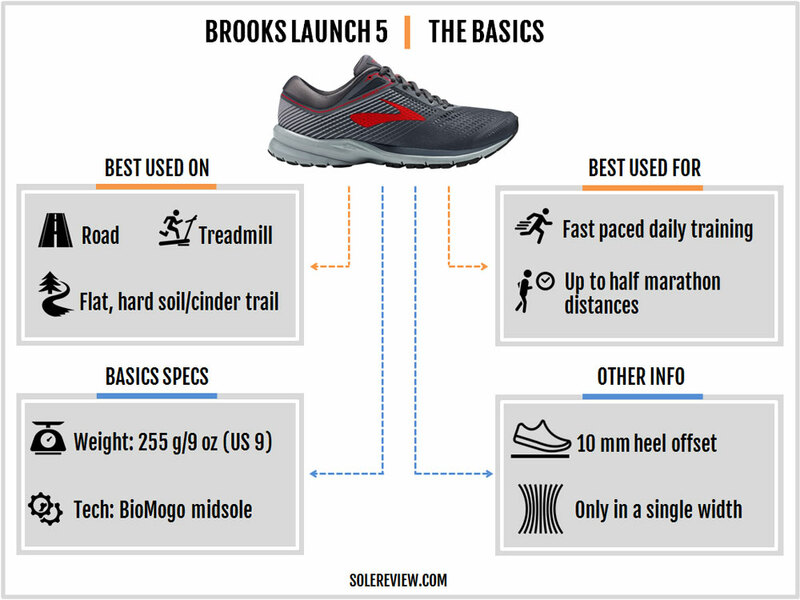 The Launch 5’s upper receives catalog-worthy updates, aligned with what’s presumed to be Brooks’s new design direction. Which happens to be a knit construction devoid of overlays (what else?) and the use of no-sew components. This means that the toe-box no longer has a stitched bumper covering it. That is replaced by an internal bumper below the engineered mesh upper. The toe-box has an interesting design element; the internal bumper has a reflective coating visible through the mesh pores. Replacing an external toe-cap with an internal one affects the toe-box room. 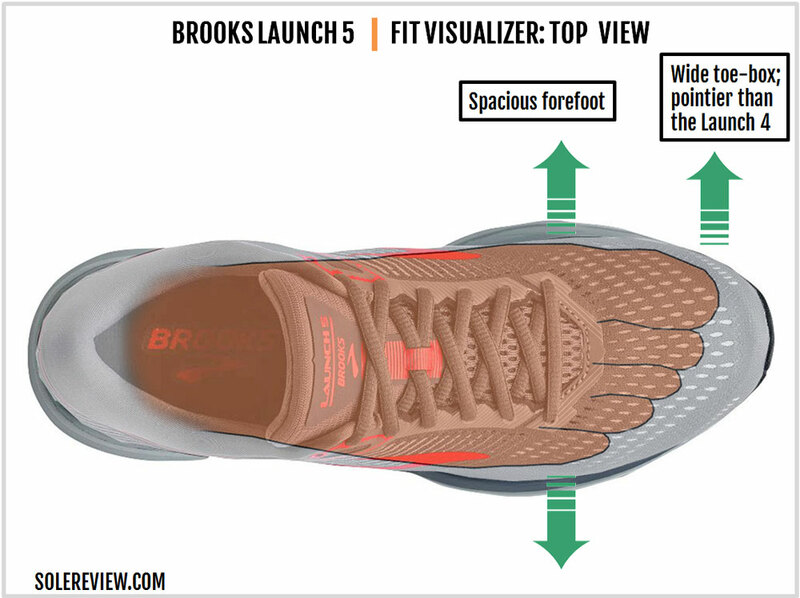 Compared to the Launch 4, V5’s toe-box is slightly shallow and pointier – particularly on the outer/lateral side where the internal bumper slopes down towards the forefoot. The Launch 5 fits true to size, but the pointed toe-box leads to the perception of shorter sizing vs the V4. The forefoot breathes better than the Launch 4 due to the new engineered mesh with strategically placed pores. There is a lining below the pores, but it is thin and does not obstruct air circulation. The Launch 5’s upper construction is based on the Levitate, so the midfoot has an inner sleeve which was absent on the Launch 4. At the same time, the external overlays used on the Launch 4 disappear. 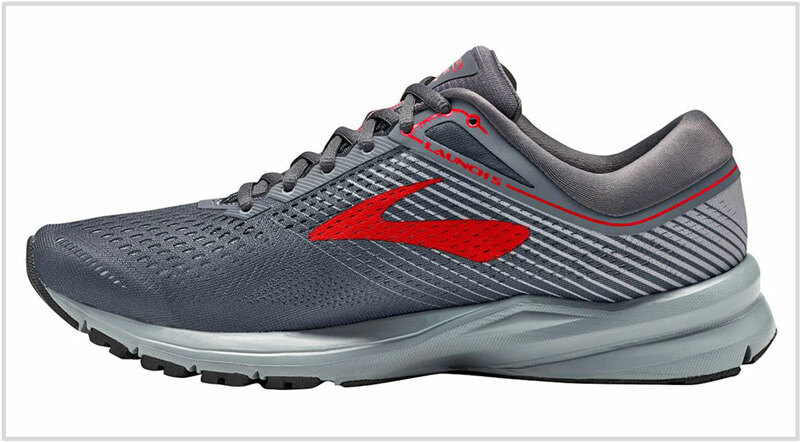 These are replaced with printed lines and a Brooks logo – again, a nod to the Levitate. Using an inner sleeve makes the midfoot fit noticeably smoother but loses a bit of grip in the process. One would presume that a sleeve adds to the grip; it does, but the effect is of a different kind. The sleeve spreads the fit over a larger area, and the fabric has a bit of give/stretch. 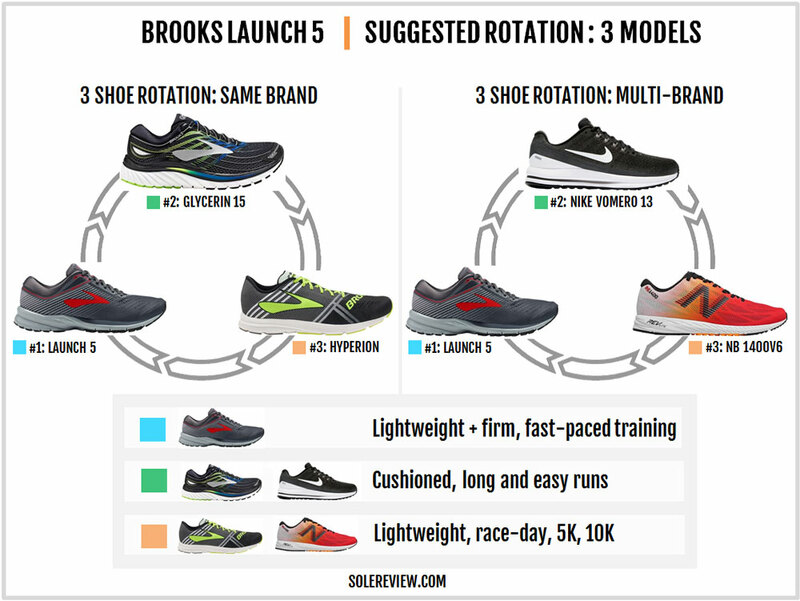 So compared to the Launch 4’s localized grip (produced by the external overlays), the Launch 5 is a more relaxed running shoe. But is this is a good thing? Historically, a snug upper and a firm ride were hallmarks of this value trainer. 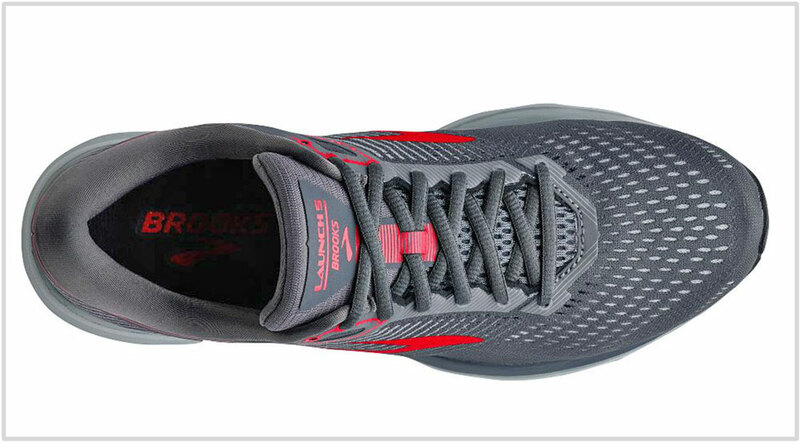 These qualities helped make the Launch the popular shoe it is; a snug upper is desirable when running fast. If you’ve run in any lightweight racer before, you’d surely agree. 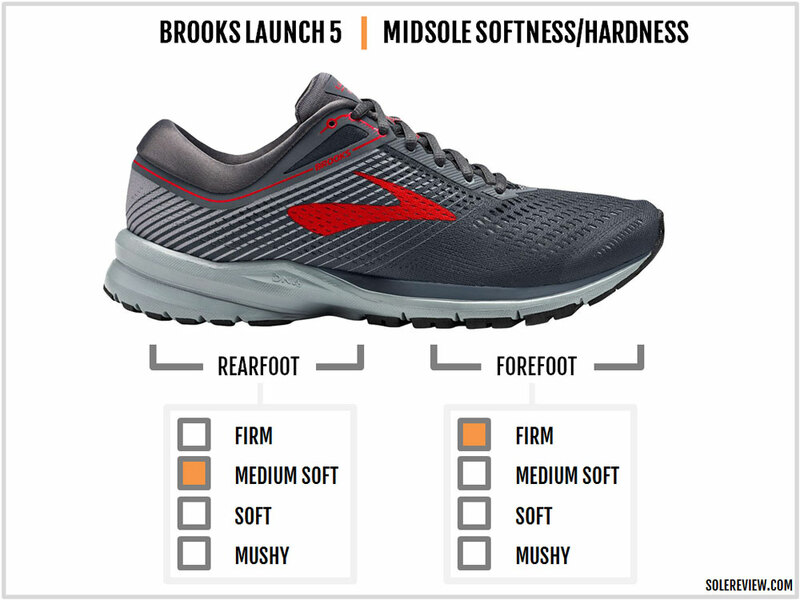 The Launch 5 lacks the overlay-assisted midfoot hold of the Launch 4. If the relaxed midfoot and the pointier toe-box are deal-breakers for you, sticking to the Launch 4 is recommended. Conversely, if you felt that the Launch 4 was too ‘business’ like, then you’ll like the more comfortable upholstery of the Launch 5. The mesh used for the upper is soft and the sleeve adds a smoothness to the interior which was missing on the Launch 4. The lacing panel is redesigned to incorporate a soft, synthetic suede like material. This feature helps the eyestay sit flush with the tongue; the Launch 4 had a thick and stiffer layered panel. The heel collar has been updated to make it softer. In retrospect, the Launch 4’s heel had a minor design flaw. The soft fabric lining was joined at the top with the outer mesh and this made the collar edge firm. The Launch 5’s collar lining now drapes over the outside, and this update makes the edges much softer. So if you felt the Launch 4’s collar edges to be stiff, know that the Launch 5 takes care of this issue. A reflective layer is placed below the mesh of the lower heel, so the Launch is good for low-light visibility. Heel grip is excellent. The collar is packed with foam and has a plush lining. Also, the collar curves inwards to produce a superior hold around the foot. Lastly, if you happen to use the heel-lock lacing row, the tongue’s shortness becomes apparent. Wonder why the Launch 5 didn’t take a leaf out of the Levitate’s playbook and make the tongue longer. 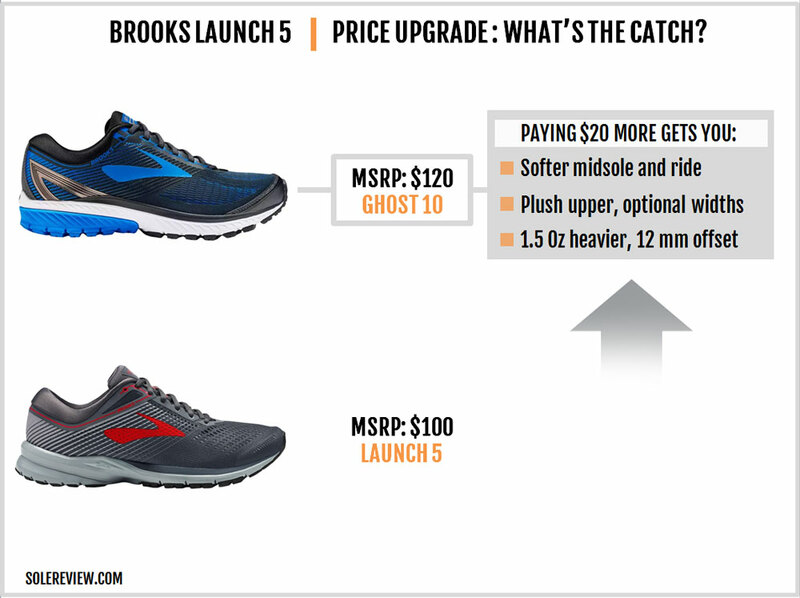 The durability of the Launch 5 compares with other Brooks shoes we’ve tested. The upper is now reinforced with an inner sleeve so expect it to outlive the outsole. Gradual wear and tear of the outsole rubber will happen much before the midsole foam deteriorates. 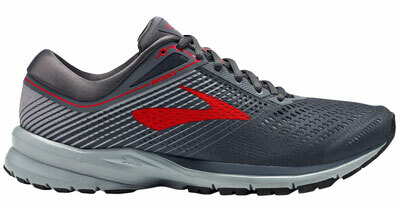 Brooks’s EVA foam has a good reputation from a durability perspective, so expect no less of the Launch 5’s midsole. For its price, the Launch 5 packs a lot of value. The upper fit is plush and smooth with no evidence of cost-cutting; the inner sleeve makes the interiors seamless. The shoe is lightweight at 9 ounces, and the firm midsole delivers smooth and quick transitions. 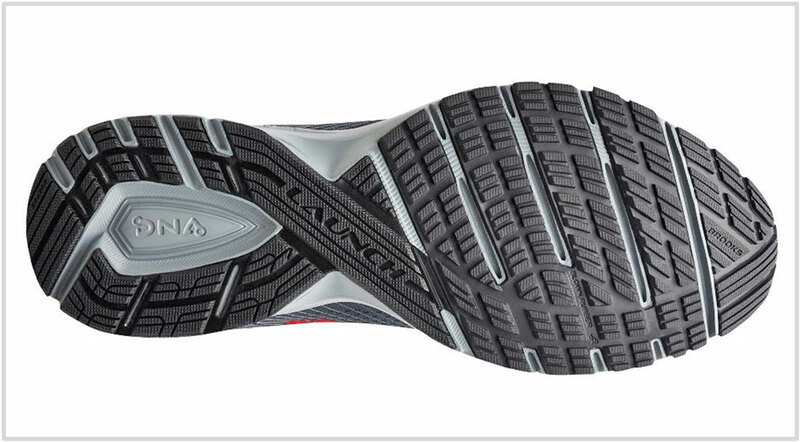 The grippy forefoot outsole complements the Launch 5’s efficient ride experience. Brooks claims that the Launch 5 is ‘springy’ but that’s not an accurate description of the ride experience. If it’s any consolation, the firm midsole is mildly responsive under the rearfoot – a result of the heel cavity and the sidewall grooves rather than the material itself. The tongue length falls short when the last row of heel-lock lacing is used. 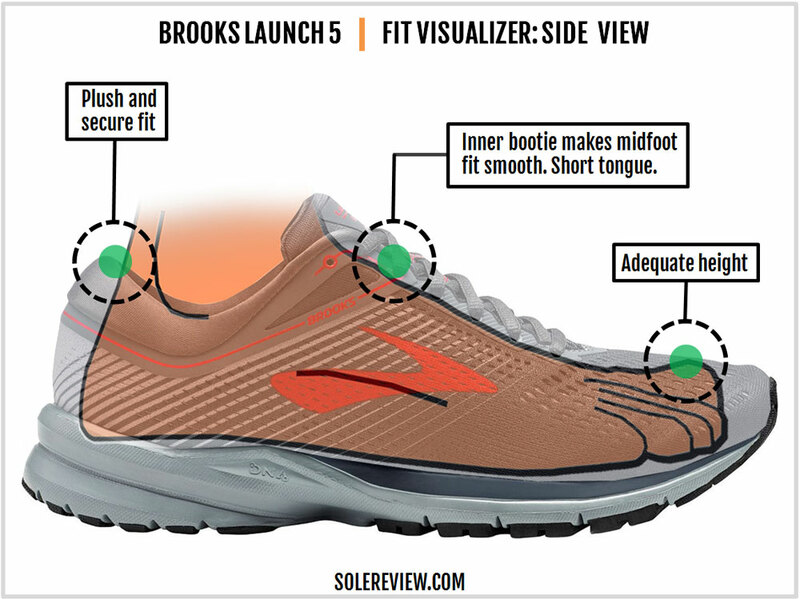 Brooks should have used the Levitate’s tongue specs as a standard instead; after all, both the Launch and the Levitate employ a similar upper construction. While the Ghost isn’t exactly a Launch replacement, that’s what you get for a $20 upcharge. The Ghost 10 is a more cushioned shoe which works better as a comfortable daily trainer. In other words, the Ghost is a better fit for longer runs such as marathons. The Ghost also has a higher heel offset of 12 mm (vs. the Launch’s 10 mm) and outweighs the Launch 5 by 1.5 ounces. 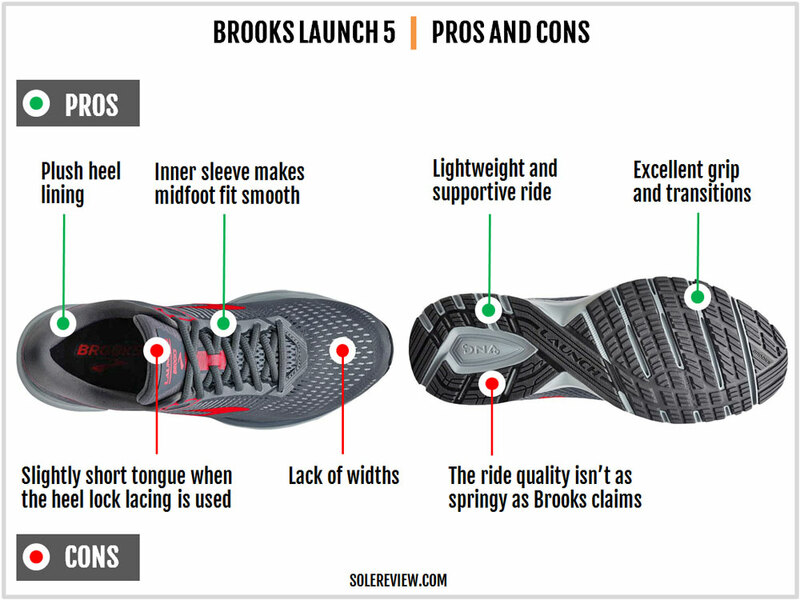 By most benchmarks, the Brooks Launch 5 is a firm riding shoe. And while it is fairly lightweight, the Launch isn’t the best choice for race day. 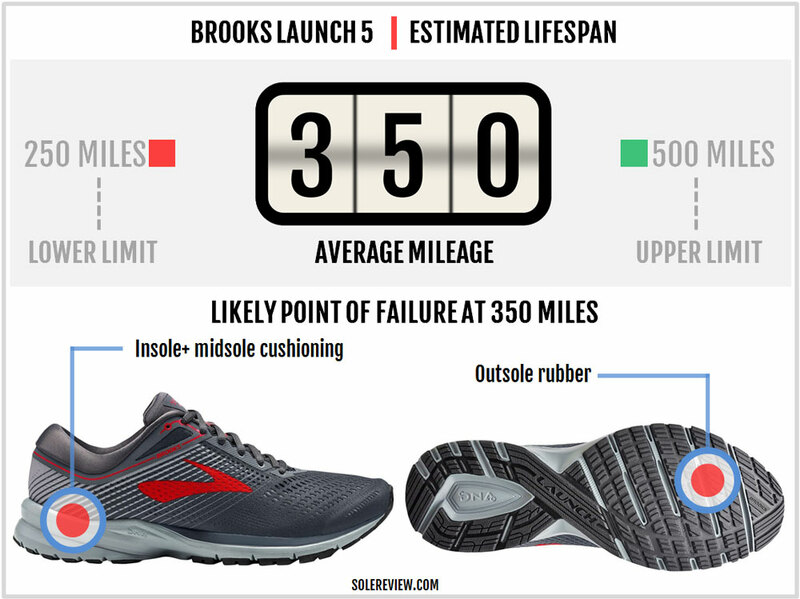 Given the circumstances, it makes sense to pair the Launch with a cushier Brooks Glycerin 15 and the Hyperion. 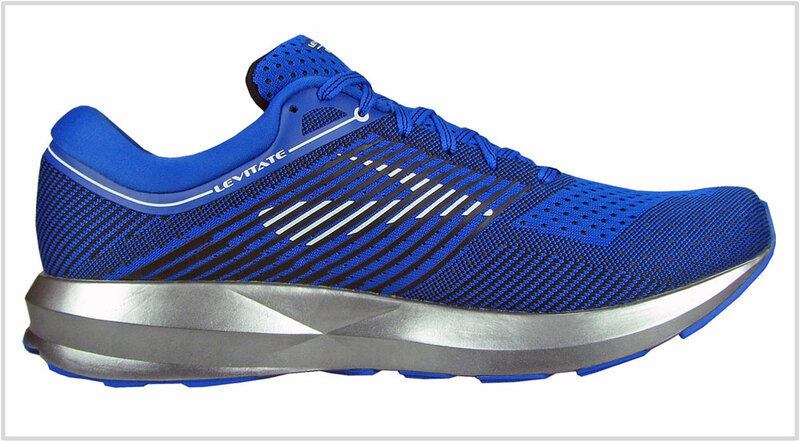 The Glycerin is great for long distance cruising; the Hyperion is your race-day or track training shoe. The Nike Vomero 13 and the New Balance 1400V6 are suitable non-Brooks replacements for the Glycerin and the Hyperion. While compiling this list, we’ve been mindful not only of the Launch 5’s category but also its price class. Lightweight neutral trainers are plentiful, but only a handful of them reside in the $90-100 price band. That is why you won’t see the Asics Dynaflyte or Saucony Kinvara here. Rather, shoes like the Asics Roadhawk FF compare with the Launch. The Roadhawk FF is the Launch 5’s closest competitor in ride quality and price class. It has a firm ride, identical price, and similar specs on heel drop and weight. Asics also has the FuseX Adapt with similar weight and price specs, but your needs will be better served by the Roadhawk FF. 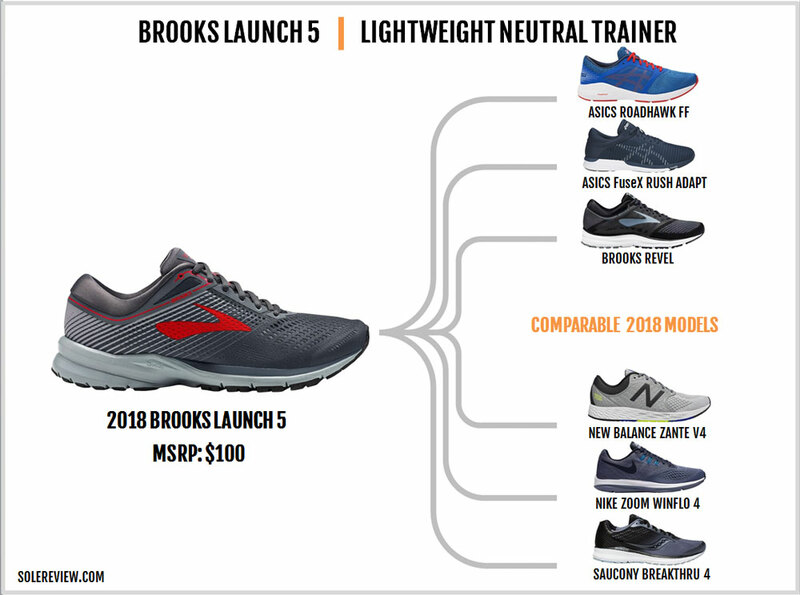 There’s a Brooks shoe which is fairly similar to the Launch. At an identical price, the Revel has a firm ride and a knit upper which fits narrower than the Launch. The Saucony Breakthru 4 is a lightweight trainer with a bit of responsive pop, thanks to the Everun topsole. If you need a softer ride within the same weight class and price segment, the New Balance Zante V4 or the Nike Winflo 4 happen to be suitable candidates.